A very rare opportunity to obtain a division of this highly prized variegated Japanese Dendrobium species ! 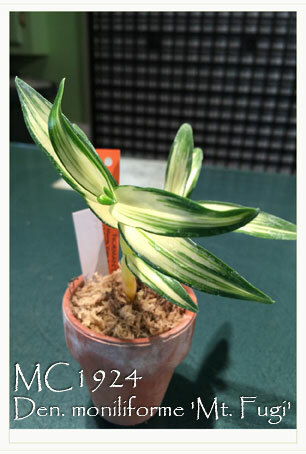 As one of the nicest variegated forms from Japan, it’s also a miniature, only reaching 4” in height. An extremely hardy species, we grow our mother plant in our conservatory year ‘round, exposing it to winter time night temperatures as low as the high 30’s, which also helps it set an abundance of buds. Provide less water and fertilizer during the winter months, especially if grown under very cool temperatures. A deciduous species, it will produce its fragrant flowers on its older leafless canes along with the onset of new growth in late winter to summer. Very Highly Recommended as that very special addition to every Dendrobium species collection !